Figure #1 is an illustration of three segments of the lumbar spine from behind. Notice the interlocking facets. 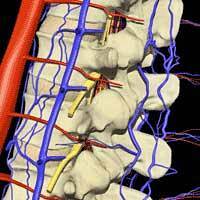 These are the surfaces that allow for movement in the spinal column. When a chiropractor adjusts the spine, the 'popping and cracking' sounds occur due to gas being temporarily released from the ligamentous capsules that surround the facet joints. The gas will reabsorb in about 15 minutes. This also stimulates important receptors, located within the joint, which are responsible for important neurological impulses being sent to the brain. The adjustment allows for proper motion to be restored to the adjacent spinal segments. Noci-ceptors = information about noxious or pain signals. ation of a vertebra looking directly down from the top of the spine. Most consider the Vertebral Body to be the weight bearing part of the vertebra. This is actually a fallacy. The body bears only 1/3 of the weight, and the two facets bear the remaining 2/3. 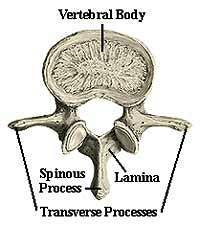 The triangular nature of the body's design for the vertebra is what makes it so strong. 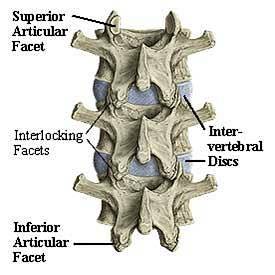 The discs attach above and below each segment of the spine and are sandwiched between the vertebral bodies. The triangular shaped hole in the middle is where the spinal cord is housed and protected. You can see how a ruptured disc could easily protrude into the spinal canal and cause symptoms for a patient. The Spinous and Transverse Processes serve as attachment points for ligaments and muscles. The chiropractic physician uses these spinous and transverse processes as levers to give an adjustment. Figure # 3 is an illustration of two vertebral segments, one disc, and the spinal cord. Notice the Spinal Nerve exiting from the spinal cord to structures in the body. The hole it exits through is called the Intervertebral Foramen. These spinal nerves provide information from the brain to muscles, blood vessels, and organs. These nerves are your body's information super highway, your internal Internet. These spinal nerves are structures that often become irritated or compromised due to improper motion or position of the vertebra. When this occurs your body tells you about it by experiencing pain. You can see how a chiropractic adjustment will alleviate the stress on a spinal nerve by allowing it to have increased space and therefore increased motion. 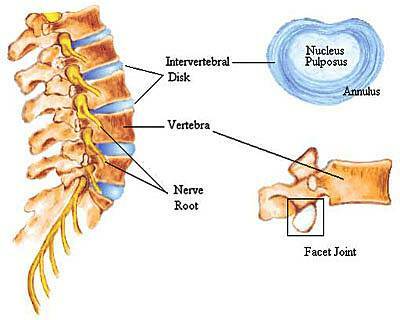 The Nerve Root arises from the spinal cord. As it exits through the intervertebral foramen, (the holes), it becomes the initial section of the spinal nerve. This nerve root is most susceptible to being compromised or irritated when there is spinal dysfunction. The Disc is made up of two distinct parts. The Annulus Fibrosis is the tough outer 1/3 rd of the disc. It has three sets of fibers within its structure that make it strong and resistant to tearing. The fibers are orientated at 30-degree angles to one another providing additional strength. Again, notice how the body is made.3 sets of fibers at 30-degree angles, 3 points of weight-bearing on a vertebra, and the triangular shape (3 sides) of the sacrum. The triangle is one of the strongest shapes in nature and is used over and over within the anatomy of the spine. The inner portion, known as the Nucleus Pulposus is a gelatinous material that gives the disc its hydraulic properties for shock absorption and weight-bearing. When injuries occur at the disc, it is due to trauma or degeneration. Trauma usually produces tears in the annulus, which allows for the nucleus to protrude out. OUCH! Degeneration results in the annulus being worn down and away. Both mechanisms allow the spinal nerve roots to be compressed. The annulus of the disc also has a nerve supply which can generate pain by itself. Either way it happens, it's bad, and it hurts. When these Disc injuries occur, many people call it a slipped disc. Make no mistake though, a disc cannot slip and this is incorrect terminology. A disc can tear, bulge, prolapse, protrude, extrude, fragment, degenerate, dessicate and even be sequestered, but it cannot slip! Figure # 5 is an illustration of the spine from the side. In this view you can see the complexity of how the Arteries in red, and the Veins in blue, supply the vertebral column and associated structures with blood. Notice how the vessels enter the intervertebral foramen to supply blood to the cord and nerve roots. Many times when there is irritation or compromise, it will affect these delicate blood vessels. This can result in reduced blood flow to the area, or small tears in the blood vessels, which will create swelling and inflammation. Both conditions will cause pain, and lead to dysfunction of the surrounding nerves that supply information from the body to the brain, and information from the brain to the body. 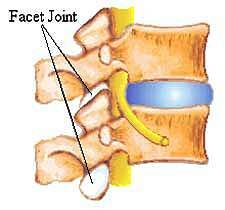 e the facets are (here named the superior articular surface) and their orientation. Here the facets are located on top of the atlas. This is so the bottom of the skull, known as the Occipital Condyles, can rest securely upon the atlas and allow for movement. Note that this is the only vertebra without a body. It truly has a unique shape for mobility. Also of great importance is how large the center hole is for the spinal column to reside. This allows for greater mobility without compromising the spinal cord. This bony ring sits upon the Axis, the second vertebra, which is so named because the atlas can freely move around it like the earth on its axis. The axis is pictured below in Figure #7. Figure #7 illustrates the second vertebra in the spine, The Axis. The Odontoid Process or Dens, is a specialized extension of the vertebral body that is found only on the axis. 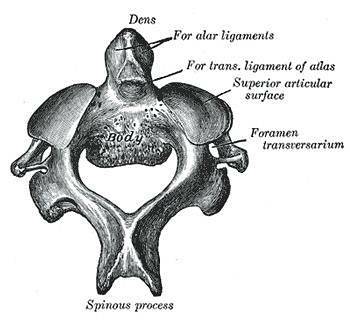 It protrudes upward allowing the atlas to move around it, and attaches to the atlas by specialized ligaments known as the Alar Ligament and Accessory Ligaments. Every piece of neurological information accumulated from the body enters the spinal cord, and travels through the atlas and axis. For this reason, the magnitude of the chiropractic adjustment applied to the atlas and axis is paramount. Together the occiput, atlas, axis complex is a marvel of human developmental anatomy. Click here to view a detailed spinal anatomy chart.